(VIA NASCAR Wire Service) DOVER, Del. — The man who once made his parents stop at Hardee’s because he thought it was Cale Yarborough’s race shop pulled even with his childhood hero in Sunday’s AAA 400 Drive for Autism at Dover International Speedway. Getting the jump on Kyle Larson on an overtime restart at the Monster Mile, Johnson crossed the overtime line on the backstretch moments before a multi-car wreck brought out the 15th caution of the race and froze the field with Johnson in the lead and a frustrated Larson running second. 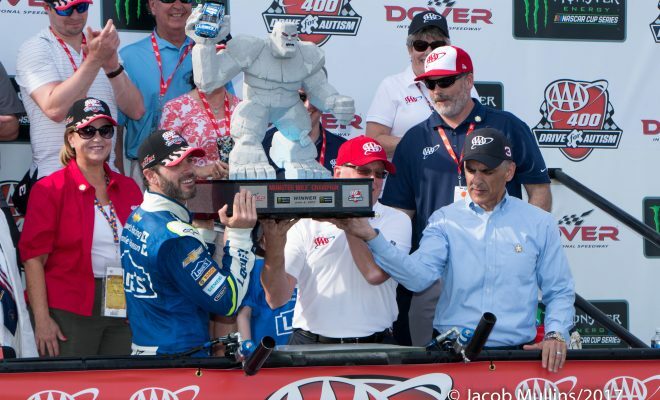 The victory was the 83rd of Johnson’s Monster Energy NASCAR Cup Series career, and it tied him for sixth on the all-time wins list with Yarborough, a NASCAR Hall of Famer. Johnson was ready for the occasion. He had a Yarborough tribute helmet to put on top of the winning car and a vintage No. 28 Yarborough Hardee’s hat to wear in Victory Lane. The win was Johnson’s series-best third of the season and his 11th at Dover, earning the seven-time champion admission into another elite fraternity. Joining Hall of Famers Richard Petty and Darrell Waltrip, Johnson is only the third driver in NASCAR’s premier series to accumulate 11 or more victories at a single track. “I never thought I would end up here in NASCAR as a kid racing in the dirt out in Southern California,” Johnson said. “I was a big Cale Yarborough fan and I remember going to a race in Oklahoma with my parents and my brother. We were driving across the country and we pulled up to a Hardee’s. Now Johnson and Yarborough are finally on the same turf – and Johnson got the tying victory despite starting from the rear of the field because of a pre-race gear change. With four laps left in the scheduled 400-lapper, Johnson’s chances of winning appeared slim. Larson had pulled away to a lead of more than two seconds, but when David Ragan’s Ford clobbered the Turn 2 wall on lap 397, Johnson had his chance. The seven-time champion had such a proficient restart on Lap 405 in the overtime that he cleared Larson’s No. 42 Chip Ganassi Racing Chevrolet by the time he reached the first corner. As the cars approached Turn 3 on the first overtime lap, Ty Dillon’s Chevrolet got loose, hit a patch of Speedy-Dry, collided with Ryan Newman’s Chevy and ignited the 10-car wreck that collected the machines of Kasey Kahne, Erik Jones, Cole Whitt and Trevor Bayne, among others. That ended matters with Johnson and Larson in the top two spots, Martin Truex Jr. in third and Newman and Chase Elliott in fourth and fifth, respectively. “It was a good race for us,” said Larson, who led 241 laps and finished second for the fifth time this year. “Obviously, I didn’t need that last caution. Yeah, I mean, Jimmie is the best of our time, probably the best of all time.